There are three different chapters when you look at a relationship: The Relationship, Love and Marriage. Each chapter has it’s own beginning, middle and end, each beautiful and poetic in their own way. The complete story of Catherine Coronado and Claudio Ibarra is no different in its structure. The contents, however, are unique, telling of a partnership filled with honesty, fiery passion, commitment and raw feelings that every couple dreams about. Coronado and Ibarra’s story begins in college in 2008. Completely absorbed in the Greek world, the Zeta Tau Alpha and Alpha Kappa Lambda, respectfully, became acquainted. Being in the same social circle and busy academic and Greek life, the two quickly built a friendship. “Before we dated, it was always fraternity events and get togethers. The [fraternity] are like brothers to me so we spent, and still spend, a lot of time together.” And that’s all that it was for two years, a great friendship. The two even spent a lot of time together working on her father’s campaign for Justice of the Peace. “We have always loved spending time together, that’s why our friends think we’re crazy,” she laughs. The friendship became romantic when Coronado turned 20. Ibarra knew that he wanted to date her, and after celebrating her birthday, he decided that he would try (once again) to see if she would finally make him her boyfriend. The persistence paid off and they seamlessly changed relationship status from “just friends” to “in a relationship.” This meant more birthdays to celebrate together, romantic getaways and family trips and forming lifelong memories, replacing “I” with “us.” It wasn’t long before they each knew that this would be the end of their dating careers, that they no longer needed to search the world for their soul mate because they had found that in each other. “The first time the thought of me wanting to marry her, was actually on her 21st birthday, which was probably a little over a year after we started dating. I remember at the end of that night everyone was giving speeches and saying happy birthday to her. When it came to me, I remember everyone was so quiet and I was a nervous freak, but I remember telling her that I loved her and that I wanted to spend the rest of our lives together, sooner rather than later,” Ibarra shares. Only the timing was off. Before Ibarra could get down on his knees and ask the question he longed to ask, Coronado needed to finish college. But the wait was worth it and soon after Coronado graduated from UTEP, they took a family trip to Newport Beach, California on Valentine’s Day. They were eating a restaurant called The Winery surrounded by Coronado’s family. As the night was closing up, the couple went outside, Coronado led to believe that they were taking a picture together, the Pacific Ocean behind them. Flashes went off, but posing soon turned into Ibarra getting down on one knee. Coronado remembers, “I was shaking all over from my emotions.” She excitingly said yes, her family witnessing the heart-felt moment, and began to plan her wedding. Catherine gushes, “The fiancé year was the best year. It was so fun to say that I had a fiancé and planning the wedding.” Besides months of planning, leading up to her wedding also consisted of a joint bachelor and bachelorette party, and a brooch party. True to a theme of pure uniqueness, Coronado wanted her bouquet to consist of brooches, both from friends and family, some going back to her great-great grandmother. “I wrote my vows the night before [the wedding] at Hotel Indigo,” remembers Coronado. The day of the wedding “was the most peaceful morning. I went down for breakfast and my sister read my vows.” Her younger sister, Elizabeth also got to read Ibarra’s vows to his future wife before the wedding, coming back into her sister’s room with tears in her eyes. Coronado remembers Elizabeth telling her she needed to rewrite her vows since Ibarra’s were so beautiful. 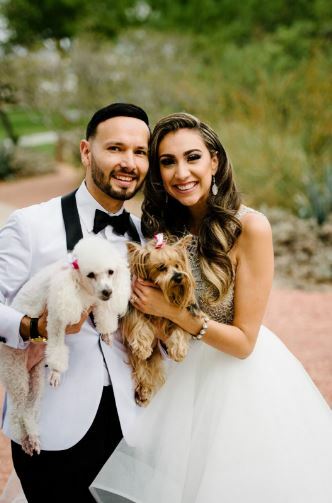 Married by Coronado’s godfather, Judge Alejandro Gonzalez, the couple started their new life as husband and wife on June 11, 2016. Not to be compared to other weddings in the city, the wedding was not typical. 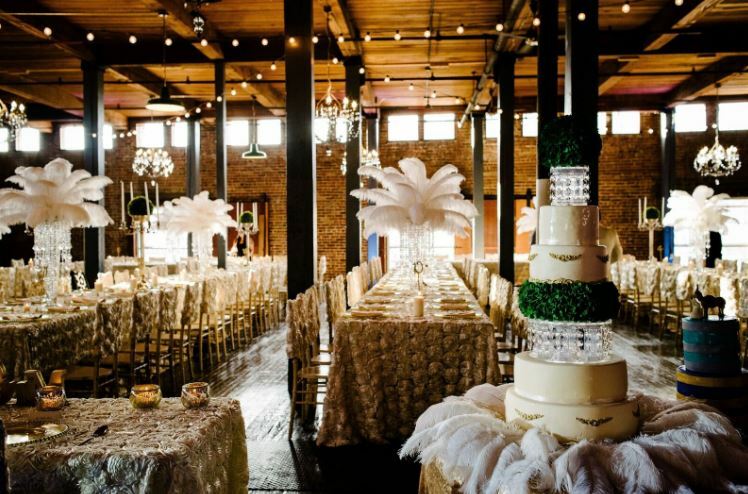 Celebrating at EPIC Railyard Event Center, the scene was runway inspired, with a full topiary wall as a backdrop, crystal and gold accents and ostrich feathers instead of flowers. Their Greek family was there, a lot of them part of the wedding party, reinforcing the bond of sister and brotherhood. Her wedding dress was more of a gown, circling around her in white perfection as she moved through her reception. “There was a moment we had before eating that we kind of had to ourselves. Other than that, we were surrounded by people,” says Coronado, looking back on the day. The only thing that she would have changed is being able to spend more time with people. The couple both agreed that the day could have gone slower, so as to appreciate and live in every moment. They danced their first dance to Keith Urban’s “Making Memories of Us,” played live by Joe Barron, and the two stepped together in sync, a foreshadowing of their married life. As the night came to an end, the smiles never faded, nor did the ecstatic feeling that rose from deep inside their bodies. They honeymooned in Puerto Vallarta, Mexico and made the smooth transition into husband and wife, for their happily ever after.